Key Points ➤ Overweight/obesity is a common, reversible risk factor for obstructive sleep apnea (OSA) severity. ➤ Behavioral, pharmacological, and surgical treatments promote weight loss and can reduce OSA severity, reverse common cardiometabolic comorbidities, and improve quality of life. 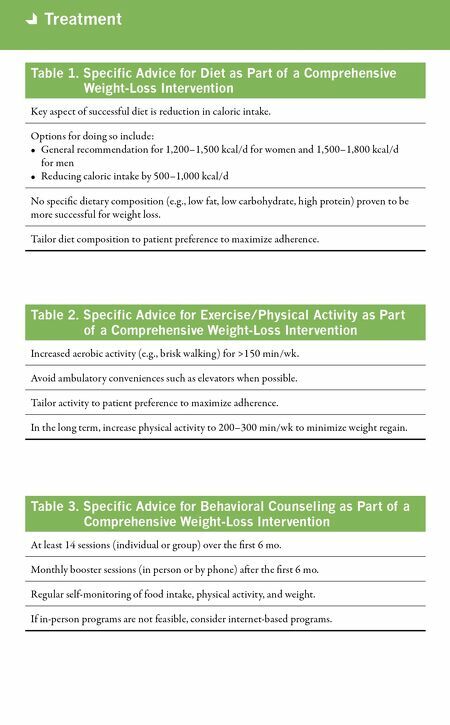 Treatment ➤ For patients with OSA who are overweight or obese (i.e., body mass index [BMI] ≥25 kg/m 2 ): • The ATS recommends participation in a comprehensive lifestyle intervention program that includes a reduced-calorie diet, exercise/increased physical activity, and behavioral counseling rather than no program (strong recommendation, very low certainty in the estimated effects). • The ATS suggests participation in a comprehensive lifestyle intervention program that includes a reduced-calorie diet, exercise/increased physical activity, and behavioral counseling rather than a program that includes only a reduced-calorie diet, with or without exercise/increased physical activity (conditional recommendation, very low certainty in the estimated effects). • The ATS suggests participation in a reduced-calorie diet (with or without exercise/ increased physical activity) rather than no diet (conditional recommendation, very low certainty in the estimated effects). • The ATS suggests exercise/increased physical activity rather than no exercise or increased physical activity (conditional recommendation, very low certainty in the estimated effects). 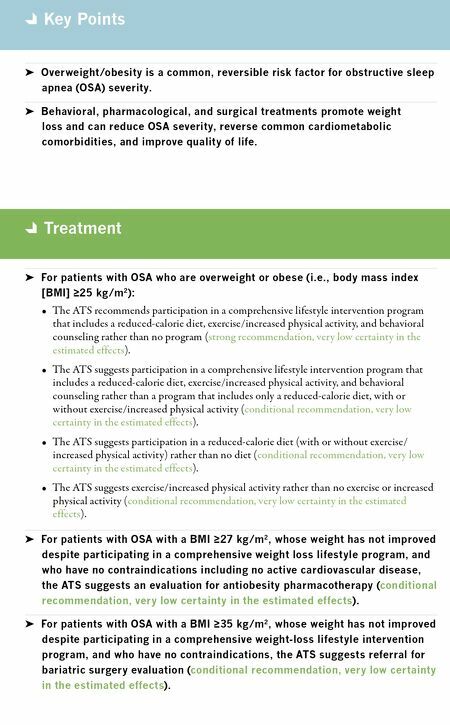 ➤ For patients with OSA with a BMI ≥27 kg/m 2 , whose weight has not improved despite participating in a comprehensive weight loss lifestyle program, and who have no contraindications including no active cardiovascular disease, the ATS suggests an evaluation for antiobesity pharmacotherapy (conditional recommendation, very low certainty in the estimated effects). ➤ For patients with OSA with a BMI ≥35 kg/m 2 , whose weight has not improved despite participating in a comprehensive weight-loss lifestyle intervention program, and who have no contraindications, the ATS suggests referral for bariatric surgery evaluation (conditional recommendation, very low certainty in the estimated effects).